It's not quite Donald Trump with a man bun, but Tim Tebow with a ponytail is tough to un-see all the same. Unlike the Photoshop mischief that gave Trump a fresh 'do, however, Tebow's new look is the real deal. Well, at least the photo is real. ESPN's College GameDay account tweeted a nice photo of the Tebowing namesake and his former University of Florida coach Urban Meyer at Monday night's college football championship game. 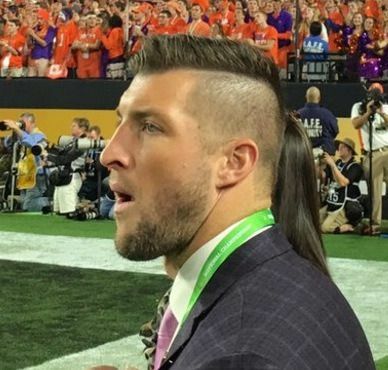 There was just one quirk: An optical illusion created by someone standing behind Tebow gives him a flowing ponytail to go with his fashionable mohawk. It's more like a ponytail-mullet hybrid, really — a dual-threat, if you will. Let's get a closer look at this modern marvel. 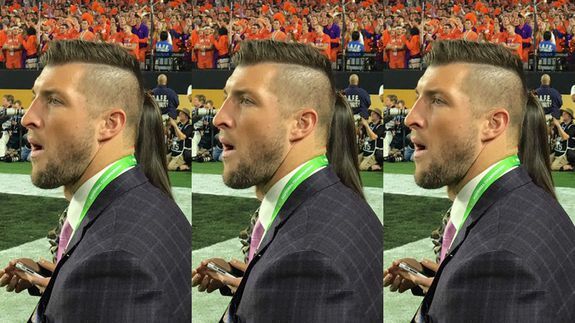 And there you have it — the Tim Tebow ponytail story we'll all be telling our grandkids one day.